A well-insulated mug may keep your coffee somewhat warm, but now scientists have designed a high-tech mug that can keep drinks hot or cold at the perfect temperature for up to half an hour. [via physorg] Researchers Klaus Sedlbauer and Herbert Sinnesbichler from the Fraunhofer Institute for Building Physics have created the temperature-regulating mug using phase change material (PCM). PCM is capable of storing and releasing large amounts of heat by changing its phase, such as changing from a solid to a liquid. To design the new mug, the researchers first created a hollow porcelain shell filled with ribbons of highly conductive aluminum. The aluminum formed a honeycomb structure, which the researchers filled with solid PCM. When the mug is filled with a hot beverage, the PCM absorbs the heat and melts like wax into a liquid. This process cools the beverage down to the optimal temperature. As the beverage cools over time, the PCM slowly releases the stored heat back into the drink, maintaining the optimal temperature for up to 30 minutes. As the scientists note, different drinks have different optimal temperatures. Warm drinks such as coffee and tea are best enjoyed at 58° C (136.4° F), beer tastes best at 7° C (44.6° F), and ice-cold drinks are best at -12° C (10.4° F). Since different types of PCM have different chemical properties and melting temperatures, the scientists can make different mugs for different beverages. The downside for the consumer is that there is not a single mug for hot and cold drinks. 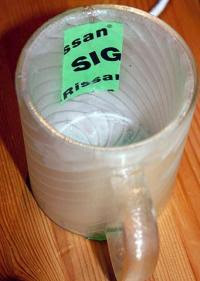 The researchers hope that, if they can find a business partner, the PCM mugs could be on sale by the end of the year. However, despite the fact that PCM is relatively inexpensive, the mugs will still probably cost significantly more than most mugs. Besides mugs, PCM could have other interesting applications. For instance, researchers are investigating the possibility of using it to keep perishable foods from spoiling, and even putting it on museum walls to protect paintings in the case of a fire, since PCM is non-flammable. PCM already has commercial uses in construction materials, where it is embedded in walls and ceilings to maintain a comfortable room temperature. Some winter jackets also contain PCM for providing greater warmth. In addition, due to their long-term memory capabilities, PCM could be used for storing computer data without the need for an electric current.